It includes these output connectors: 24(20 4)pin x 1, P4-12V 4pin x 1,SATA II 15pin x 3, Molex 4pin x 3, and FDD 4pin x 1. 0° C ~ 50° C on Output Load ;. Max Output Power 400 Watt. works great. MTBF 100,000 Hours on Maximum Load at 25°C. Connector included: ATX Connector 24 (20 4) Pin X 1 PC, P4-12V 4 Pin X 1 PC, SATA 15 Pin X 3PC, Molex 4 Pin X 3 PC, Floppy 4 Pin X 1 PC. Compatible models shown above are for reference purpose only. not all compatible models are listed. Input Frequency Range. Output connectors includes 24(20 4)pin, P4-12V 4pin, SATA II 15pin, Molex 4pin, and FDD 4pin. Maximum Power. Designed for the TFX form factor to provide compact flexibility for small computer cases. Dell Inspiron 530s 531s Slimline SFF, Bestec TFX0250D5W. Compatibility: Bestec TFX0250D5W / Dell Inspiron 530s 531s. Furthermore, it frees up more room inside the case for better air circulation and it is easy to install because it is slightly smaller in size. The item works fine. Works like a champ, just what the computer needed! MTBF:100,000 Hours on maximum load at. 16A 0.5A 9A 9A 0.8A 16A 2.5A. 5V -5V 12V1 12V2 -12V 3.3V 5VSB. 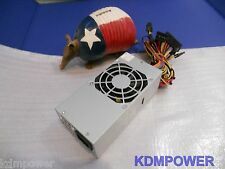 Bestec Power Supply Model TFX0250D5W 250W Max Good Condition . Condition is Used. Shipped with USPS Priority Mail. And Slimline DCSLF Bestec TFX0250D5W. 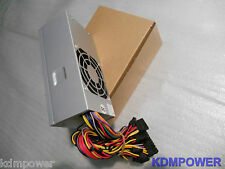 AC Power Cord is NOT included, however it is compatible with your original Dell / Bestec power cord. PFC (Power Factor Correction) technology is standard to provide better efficiency. Trending at $37.11eBay determines this price through a machine learned model of the product's sale prices within the last 90 days. 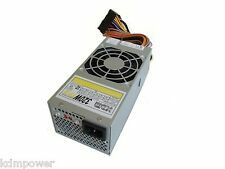 TFX0250D5W Replacement Power Supply Bestec Dell Inspiron 530s 531s Slimline SFF! Mother Board Connector - SATA Connectors - 4 pin x 1. - CPU Connector - 20 4 pin Connector x 1. SOLD OVER 100 . During past month. 12 Volt Rails. Type: TFX/ SFF. Compatible models shown above are for reference purpose only. not all compatible models are listed. MTBF: 100,000 Hours on Maximum Load at 25°C. Output: Power250 Watt. Thermal Overload Cut-off Protection. AC Power Cord is NOT included, however it is compatible with your original Bestec power cord. High efficiency design ensures lower heat and lower noise operation. Active PFC (Power Factor Correction) : 99% typical. Output Power 250 Watt. MTBF 100,000 Hours on Maximum Load at 25°C. Usage note Frequency 60 / 50 Hz. Current 13A 2A 7A 7A 0.3A 13A. Compatible models shown above are for reference purpose only. not all compatible models are listed. Compatible models shown above are for reference purpose only. not all compatible models are listed. MTBF: 100,000 Hours on Maximum Load at 25°C. Frequency: 60 / 50 Hz. 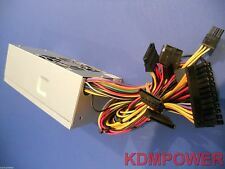 Connector included: ATX Connector 24 (20 4) Pin X 1 PC, P4-12V 4 Pin X 1 PC, SATA 15 Pin X 3PC, Molex 4 Pin X 3 PC, Floppy 4 Pin X 1 PC. AcBel PC8046. Bestec TFX0250D5W. PFC (Power Factor Correction) technology is standard to provide better efficiency. PFC technology built-in to provide greater transfer efficiency. This standard feature extends the life of the already long-life fan further and provides lower noise operation. Dell Part Number: YX301 0YX301 CN-0YX301. Model: TFX0250D5W. - Inspiron 5305 531S 530 545. Form Factor: Slim Desktop. - Floppy Drive Connector. Max Power: 250 Watt. Connector included: ATX Connector 24 (20 4) Pin X 1 PC, P4-12V 4 Pin X 1 PC, SATA 15 Pin X 3 PC, Molex 4 Pin X 3 PC, Floppy 4 Pin X 1 PC. Compatible models shown above are for reference purpose only. Compatible models shown above are for reference purpose only. not all compatible models are listed. MTBF: 100,000 Hours on Maximum Load at 25°C. WE TRY TO DESCRIBE THE PRODUCT TO OUR BEST KNOWLEDGE. The power switch on the back is like a cut-off switch to kill the power to the computer altogether, in normal operation it should always be in the on position. The only reason to use this switch would be if the computer froze and you want to turn it off, Also it could be used when there is a storm to protect against a surge coming into the computer. Model: TFX0250D5W. Manufacturer: Bestec. If an accessory is not shown in the photos it is not included in what you will receive. We do our best to fully describe the condition of each item. Actual Weight (Lbs) : 2.1. Output Power 300 Watt. MTBF 100,000 Hours on Maximum Load at 25°C. Usage note Frequency 60 / 50 Hz. Current 13A 0.5A 9A 9A 0.8A 13A 2.5A. Compatible models shown above are for reference purpose only. Dell Part # XW605 0XW605. Type: TFX SFF. Dell Inspiron 530s. Dell Inspiron 531s. after handling. We take our reputation seriously. Compatibility: Bestec TFX0250D5W / Dell Inspiron 530s 531s. Furthermore, it frees up more room inside the case for better air circulation and it is easy to install because it is slightly smaller in size. BUY IT NOW PRICE IS FOR SINGLE ITEM ORDERS. Your electric bill saving may vary depending on your usage and your state's electricity rate. 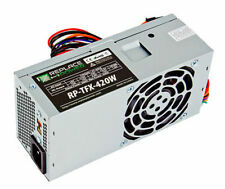 This HIGH POWER® TFX-300W unit will waste only 29.44 watts to heat (Typical Efficiency: 83.59%). Much more energy efficient, with over 80% efficiency, than the original Dell OEM unit. 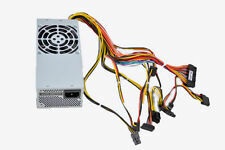 Output Power: 300 W. Connectors: 4 Pin 12 V,20 Pin,20 4 Pin,24 Pin,4 Pin Peripheral,Floppy Drive,SATA I. Form Factor: TFX. $TFX0250D5W Replacement Power Supply Bestec Dell Inspiron 530s 531s Slimline SFF Feature Specification Compatibility What's in the box Payment Shipping Return Contact us FeatureSpecificationCompatibilityWhat's in the boxPaymentShippingReturnContact us ---Type: TFX/ SFF ---Silent Fan Cooling System ---Short Circuit & Over Voltage Protection ---Thermal Overload Cut-off Protection ---Complies With ATX 12V 2.0 Version ---Support Intel and AMD Processors ---Supports Serial ATA ---Very quiet operatio Usage note: Please Check the original power supply. Compatible models shown above are for reference purpose only. not all compatible models are listed. $Features: Type: TFX/ SFF Silent Fan Cooling System Short Circuit & Over Voltage Protection Thermal Overload Cut-off Protection Complies With ATX 12V 2.0 Version Support Intel and AMD Processors Supports Serial ATA Very quiet operation. Usage note: Please Check the original power supply. Compatible models shown above are for reference purpose only. not all compatible models are listed. 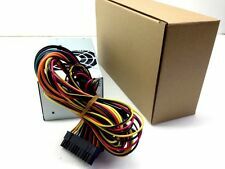 Connectors: ATX Connector 20/24 Pin X 1 PC, P4-12V 4 Pin X 1 PC, SATA Pin X 2 PC, Molex 4 Pin X 2 PC, Floppy 4 Pin X 1 PC Specifications: Input: 115-230V 60/50hz 10A/6A, 60Hz/50Hz Output: 5V 13A, -5V 0.5A, 12V1 9A, 12V2 9A, -12V 0.8A, 3.3V 13A, 5V-SB 2.5A Manufacturer KENTEK Temperature Range: Operating: 0°C ~ 50°C on Full Load. Vostro 200 (Slim), 200s, 220s, and Studio 540s small form factor (SFF) systems. 3x SATA Power Connectors;. 1x Floppy Power Connector;. 1x 4-Pin ATX power Connector. - 2x SATA Power Connectors.